Dramatic coastlines on the Torre Caleta walk. 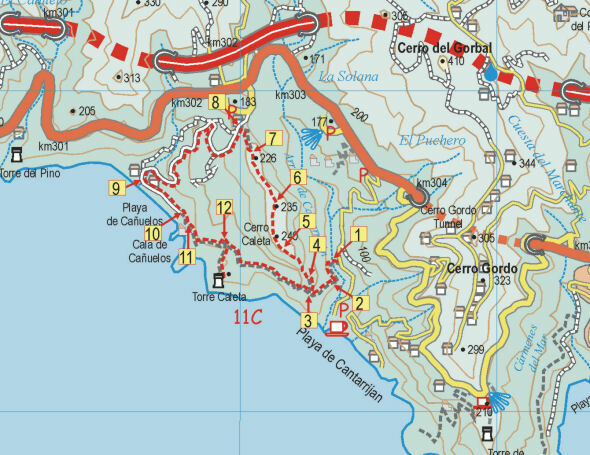 Map segment for the Torre Caleta walk. 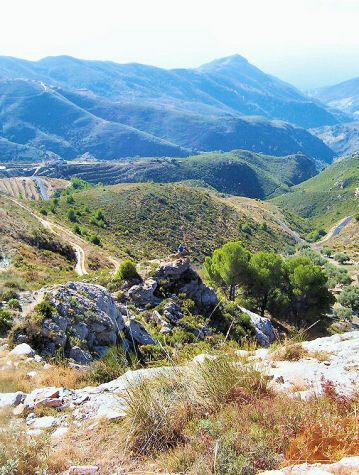 “The Axarquía is one of Spain’s great places, and among the greatest places within it are the Sierras Tejeda and Almijara, which form the backbone both of the region and the present publication. 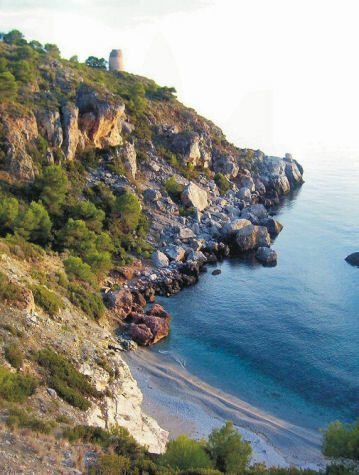 Blessed with high summits, dizzying pinnacles, dramatic crags, deep ravines, dozens of springs, delightful rivers and the best coves on the Costa del Sol, this is an area that has something for everyone. And the only prerequisites for benefitting from all this are a desire to get off the beaten track and a set of relatively, sometimes very, sturdy legs. Axarquia; Las Cuadrillas, Walk 24. There’s information about the book Walk! The Axarquia (available as a printed book or as a pdf download book in A4 format) and the maps available for the region (printed, on paper and on Super-Durable material); there are also Custom Maps for Garmins for GPS users. So many visit the Costa del Sol and keep their eyes seawards, only vaguely aware of the backdrop of majestic mountains behind them. It’s such a varied area – I like to spend some days on the coast, then get away from the hustle and bustle in the mountains. Perfect! Certainly one of my favourite places in Spain ad much of it still dramatically underexplored. Certainly one of my favourite places in Spain and much of it still dramatically underexplored.